Internet security, especially domain name security becomes most critical problem nowadays. To solve this problem, google announced Two Factor Authentication(TFA) for all service associated to google account. Like many other products, google providers full function API to everyone. As android device(mobile phones/tablet) grow to 1st removable smart device, it is now very convenient to integrate TFA into web sites and service. 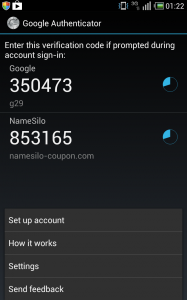 Besides domain defender, Namesilo recently activate google Two Factor Authentication(TFA) for all customers. This greatly solids the account security. Two-step verification (also known as Two-factor authentication, abbreviated to TFA) is a process involving two stages to verify the identity of an entity trying to access services in a computer or in a network. The account remains safe even if user name and password leaking happened. UPDATE: NameSilo replace Google TFA(Two Factor Authentication) with Authy app because many many customers in troubles by losing their TFA devices. Authy can get back the TFA account with id and password. 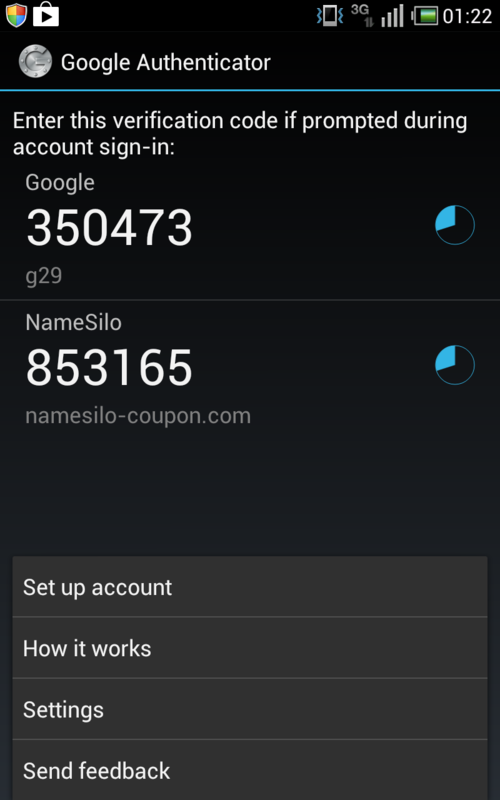 Even if your TFA device(phones, pads) lost, you can still accessing the NameSilo account with new device & pre-setup Authy account and password. Come into 2-Factor Authentication page and read carefully of directions. Download the 2-Factor Authentication application to your account and run it. More information can be found on this Google help page. Save the QR code picture or the code by printing it out and put it into your safe place. This is very important, once you lose your device on which the 2-Factor application installed, the saved QR code or the code is the only way to regain access to account. Now the process of adding 2-Factor Authentication is finished. The six digital code needed when try to log into namesilo account.